Jules: Happy Halloween! I am starting this post, to which Eisha plans to add some comments. And let me tell you that when she sees this image, she just might kill me. It’s taking a great deal of courage for me to post it to begin with. That’s an image from the Bell Witch legend, a story, according to that link, which is “America’s Greatest Ghost Story.” Or so says Dr. Nandor Fodor, a researcher and psychologist. 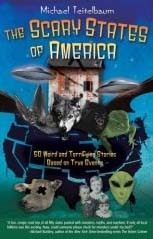 Or, if you grew up in middle Tennessee, it’s the “One Story That Will Scare the Holy Utter Crap Out of You for the Rest of Your Life,” or so say bloggers Jules and Eisha. 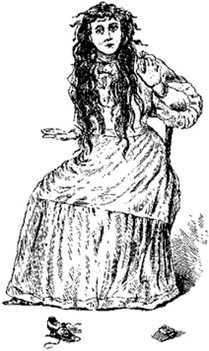 The image you see there (in the public domain) is an artist’s sketch of Betsy Bell. Perhaps the most widely-used “Bell Witch” photo in existence, it was created in 1893. (The printing plates were made by Sanders Engraving Company out of St. Louis, MO and were used for M.V. Ingram’s 1894 book, An Authenticated History of the Bell Witch). And as for the book cover image below and what it has to do with the Bell Witch, well, I’ll get to that in a moment. “The spirit identified itself as the ‘witch’ of Kate Batts, a neighbors of the Bell’s, with whom John had experienced bad business dealings over some purchased slaves. ‘Kate’ as the local people began calling her, made daily appearances in the Bell home, wreaking havoc on everyone there. People all over the area of soon learned of the witch and she made appearances, in sounds and voices, all over Robertson County. Happy Halloween! Below is the Robert’s Snow schedule for Wednesday, October 31, 2007. 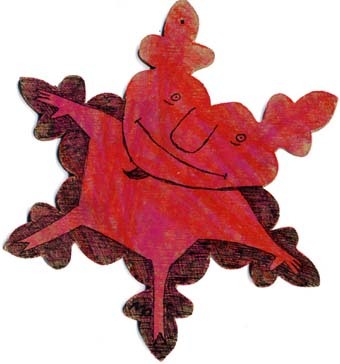 Pictured here is an older snowflake, Mo Willems’ 2005 creation, entitled “Snow Devil,” done in pencil and ink. Mo’s ’07 snowflake, you’ll see below, is being featured today. 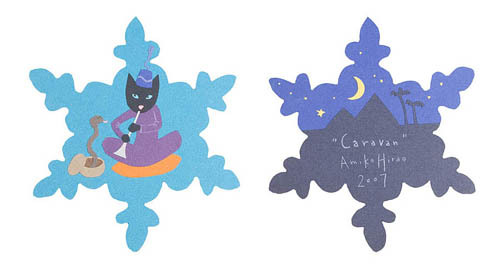 I had planned on posting a book review today up above this snow schedule post, but then I saw this snowflake (also a Christmas-tree topper) for the 2007 Robert’s Snow: for Cancer’s Cure online auctions. It was created by illustrator Linda Wingerter. Why not let this sit atop our blog for a while in all its glory? Isn’t she gorgeous? As in, heart-stoppingly beautiful? Her name is Grace. I wouldn’t dare cover her up today. 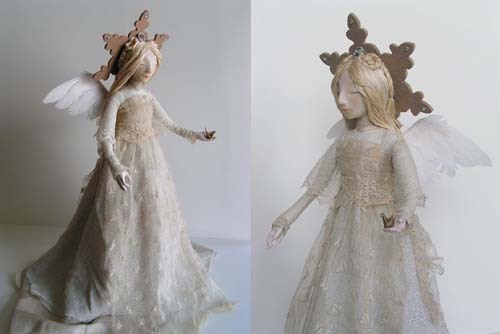 If you’re not familiar with Linda’s work, you can read our April interview with her, in which her talents as an illustrator, Blue Rose blogger, doll artisan, fire-spinner, puppeteer, and rollergirl are revealed. 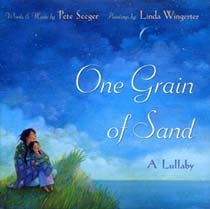 She’s probably best known for her illustrations in 2002’s One Grain of Sand: A Lullaby (Little, Brown and Company), a picture book adaptation of a lullaby written decades ago, which folksinger Pete Seeger composed for his daughter. 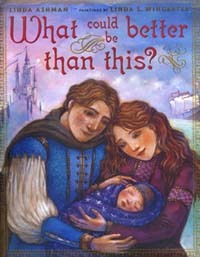 Linda’s most recent book was 2005’s What Could Be Better Than This? 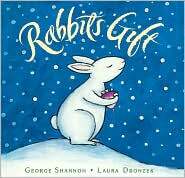 by Linda Ashman (Dutton Juvenile). It’s a twist on the traditional fairy tale, the story of a dragon-slaying king and his seafaring bride who finally find their “happily ever after” in the simple, everyday wonders revealed to them by their young child. 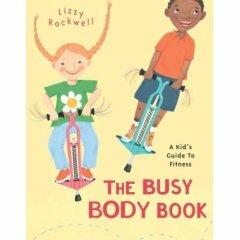 You can read about all of Linda’s illustrated titles thus far in that afore-linked interview. I failed to find out in which auction (Auction 1, 2, or 3) this snowflake/tree-tropper will be included. But, since I have a feeling people will be very curious to know, I’ll try to find out today and amend this post later. ADDENDUM: Okeley-dokeley. Linda’s snowflake will be auctioned off in Auction 3: December 3 to 7! Hi. No blogger interview this week, ’cause next week will be the Winter Blog Blast Tour in which we here at 7-Imp will feature five interviews with some children’s and YA authors whom we respect and admire a great deal, so WAHOO! But we gotta prep for those interviews, so no blogger feature today. Sorry. And none next week, since we’ll be interviewing authors each and every day, but the week after that . . . well, we will feature none author than Andrea or Mark (whoever sends responses first!) of Just One More Book!! Excellent. 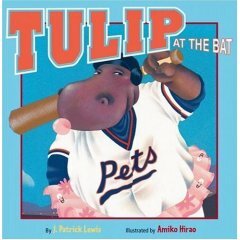 Today’s post is a quick one to show you the book cover images, title info, and a bit of an excerpt from each review for the eight picture books I covered this week at ForeWord Magazine in their “Shelf Space” column. I mentioned this last Friday, but I gotsta gotsta gotsta see my book cover images, especially when we’re talking picture books (and the Shelf Space column doesn’t include book covers), so here they are in case you’re interested in reading about them. My write-up this week is called “Size Matters — And So Do Your Friends and Neighbors,” and if you’re wondering what I mean and which book goes where (size? friends and neighbors? ), why, you’ll just have to go read. 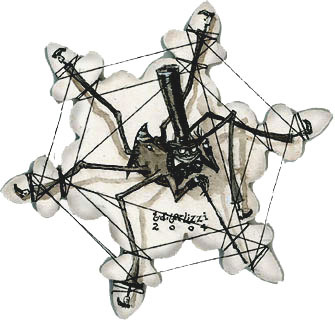 Pictured here is Tony Diterlizzi’s 2004 snowflake for Robert’s Snow: for Cancer’s Cure, entitled “Mr. Spider’s Webby Snowflake.” Neat, huh? Now, I’ve been featuring ’07 snowflakes lately — those, that is, which have not already or will not be featured by a blogger in this Blogging for a Cure event (remember that the illustrators and snowflakes that participating bloggers are featuring are only the ones that the Dana-Farber Cancer Institute had ready to go when this multi-blog event was organized). But, you know, I just looked at the current list of ’07 snowflakes, and all of those illustrators are scheduled to be featured or have already been featured. Those who haven’t been featured or aren’t scheduled to be covered, I wrote brief write-ups for — and featured the snowflakes, of course — here at 7-Imp last week (Jarrett J. Krosoczka’s here; Yuyi Morales’ here; Ashley Bryan’s here; Anna Dewdney’s here; Amiko Hirao’s here; Patrick Girouard’s here; and Lizzy Rockwell’s here). Unless I’m missing someone, we’ve got that list covered! 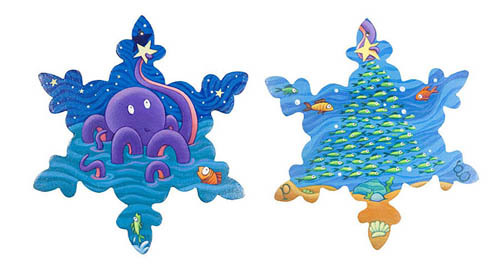 So, until I see new snowflakes up there, I’ll keep showing you some of the wonderful older ones. And remember that you can see all of the snowflakes at the Robert’s Snow auction site. Below is the Robert’s Snow illustrator-and-snowflake feature schedule for Sunday, October 28 (scroll down after clicking “read the rest of this entry”). 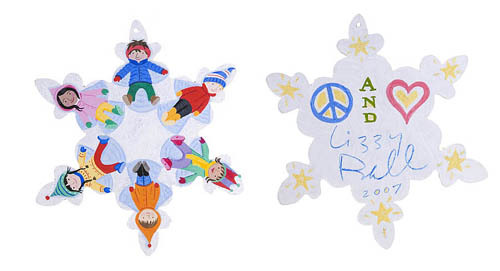 Lizzy’s snowflake will be auctioned off in Auction 2 from November 26 to 30. Below is the Robert’s Snow illustrator-and-snowflake feature schedule for Saturday, October 27 (scroll down after clicking “read the rest of this entry”). And here’s his very colorful portfolio. 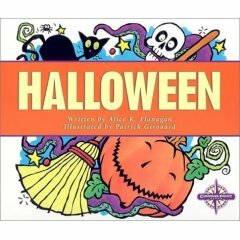 I see, after a bit of research, that he also illustrated Halloween by Alice K. Flanagan (Compass Point Books, 2001). There’s an older title for you — just in time for the upcoming holiday. Patrick’s snowflake will be auctioned off in Auction 1 from November 19 to 23. Eisha and I are about to complete our month-long guest-blogging gig for ForeWord Magazine. 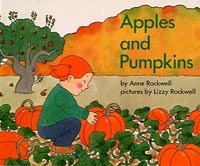 This week, I wrote a picture book round-up and it’s entitled, “Size Matters -– And So Do Your Friends and Neighbors” (and we’ll be writing for them next week as well). 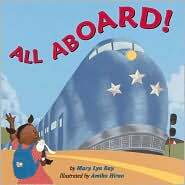 Lately, I’ve had my mind on picture books whose illustrators, in one way or another, play around with the notions of size and perspective, as well as the abundant number of books out and about now which focus on one’s community and circle of friends. So, I chose eight of them to review. It’s posted this morning over at “Shelf Space,” ForeWord’s column where we are guest-blogging until the end of this month (I’ll have to plan on a Monday post with all the great book cover images). 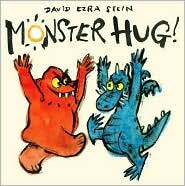 One of the books I reviewed is the fabulous Monster Hug! by David Ezra Stein, whose snowflake is also being featured today at HipWriterMama’s site. I began my review of that book thusly: “I think an up-and-coming picture book illustrator we all can get most excited about this year, other than the obscenely talented Jonathan Bean, is David Ezra Stein.” Yes, my love for Stein’s art work is strong (and fortunately for us and all our readers, he agreed to let us feature some of his illustrations on a Sunday in November. Swoon! Swoon!). when Frankenstein’s torch singing lit up the stage. Heh. You can read the rest here. And for another laugh, here’s another Nesbitt poem, “Halloween Party,” at the aforementioned Poetry Foundation site. 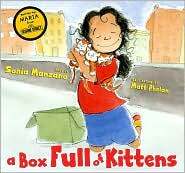 Don’t you just want to read those aloud to some late elementary/early middle school students? Enjoy. And happy Poetry Friday (and almost-Halloween)!